Video: Veggie Tales - Are You My Neighbor? Objective: Jesus wants me to be a servant of all. What did Jesus do to serve the disciples? How does it make you feel when you help someone? How does it make God feel when you help someone? If you can't see God, how can you tell that He is happy and smiling at you because of what you did? What are some examples of being a servant to others? - Jesus is King and yet He served others. Discuss a servant's heart. Discuss with your child what it means to be a happy helper and ways he/she can help others. Trace each family member's hand on a piece of poster board. Add the title "Happy Hands are Helping Hands." Place the poster in a prominent place in your home. Each time a family member does something to help someone, place a happy face sticker on that person's handprint on the poster. - Discuss who serves you, and send thank you cards to the person to express thankfulness for their servant's heart. - View Veggie Tales - Are You My Neighbor? - Paint the Jesus Serves the Disciples worksheet with a rag or paper towel. - Purchase an apron or make one by cutting the shape out of butcher block paper and use ribbons for the ties. Decorate. Use to serve snacks to your family. - March to various beats of a drum. Beat a drum slowly and then fast. Have your child move according to the beat. When the drum stops, instruct the child to freeze. - Discuss your different voices: whisper (library voice), talking (inside voice), yelling (outside voice), singing, humming. Then discuss opposites using musical instruments - high/low, loud/soft. - Weeks 23 focuses on the "hook" character "f". Start by creating the character using play dough snakes or pipe cleaners for the bubbles and move to writing the characters on the Hook Characters worksheet to show the progression of the letters and numbers. - Play Leapfrog: Leapfrog is a continuous game of leaping over the back of those in front of you and then allowing the behind to leap over your back. The first person kneels on the ground and then bends over. The next player places his/her hands on the first person's back and leaps over by straddling legs wide apart on each side. On landing he kneels and bends as well and a third leaps over the first and second, the fourth over all the other, etc. When all the players have "leaped" and are on the ground, the person at the last of the line begins leaping over all the others in turn and the game continues. - Cut out the shapes on the Frog worksheet. Combine this with the "Hearing" unit by scrunching up various items to paint with. Example items: tissue paper, Kleenex, writing paper, wax paper, foil, construction paper. Listen to the sound made by each item. 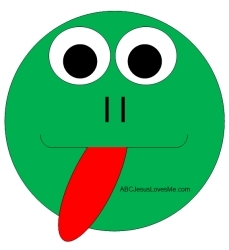 (Adapted from Tripod) Using the various items, stamp paint the tongue red and the head green. Let dry. Role the tongue around a pencil to make it curl. Draw a mouth on the frog. Cut a slit on the mouth and insert the tip of the tongue. Tape the end on the back of the frog. Glue on the eyes and nose pieces. Create a Memory Obstacle Course using numbers and letters. If your child is ready, ask her to get both a number and a letter. 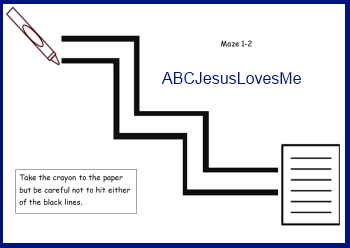 Teach pencil control with Mazes. Instruction the child to keep the pencil from hitting the lines while doing the mazes.